1. Pour desired amount of warm water (approx. 100°F/40°C) into the bottle. 2. Add powder infant formula. Always add powder formula to water. Store scoop by sliding handle of DRY scoop into slot located in the upper left corner above the powder. 3. Cap bottle and shake well until powder infant formula is dissolved. Feed immediately. Discard any remaining baby formula in the bottle after one hour from the beginning of the feeding. Member's Mark Sensitivity® is a reduced lactose formula at Sam's Club® that contains a blend of nutrients for Eye and Brain Development. Our Sensitivity® Formula is a milk-based, low lactose formula† for babies who may be sensitive to lactose. The exclusive Sam's Club baby formula brand, Member's Mark Formula meets FDA guidelines and the dietary recommendations of the American Academy of Pediatrics (AAP), the primary organization dedicated to the health and well-being of infants and children. Member's Mark Formula is clinically proven to be as well tolerated as Similac® infant formula. * Please conduct your own side-by-side formula comparison; compare our label to the nationally advertised formula brand. If you believe your baby is sensitive to lactose, please consult your child's pediatrician. Be sure to ask about trying Member's Mark Sensitivity® 1. For more information on lactose sensitivity and low lactose formula, please visit the AAP website www.HealthyChildren.org. Member's Mark Sensitivity has human milk oligosaccharide (HMO), a prebiotic that helps establish beneficial bacteria for immune support. HMOs are oligosaccharides**** commonly found in breast milk. The most abundant HMO is known as 2' -fucosyllactose, or 2' -FL. The oligosaccharide 2' -FL HMO is found naturally and abundant in most mothers' breast milk. We added 2' -FL HMO to Sensitivity so it can help nourish your baby's immune system to be more like the immune system of a breastfed baby. 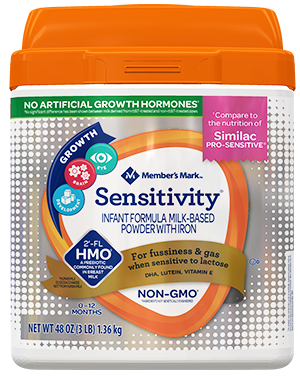 Like our other milk-based formulas, Member's Mark Sensitivity offers complete nutrition for your baby's first year. It is also Non-GMO, meaning it is produced using ingredients that have not been genetically engineered. Sensitivity is also gluten free and Certified Kosher by the Orthodox Union--(U)D.
Member's Mark Sensitivity features a blend of nutrients found naturally in breast milk for brain and eye development: DHA, Lutein, and Vitamin E.
DHA supports mental and visual development. Lutein is a naturally occurring carotenoid and antioxidant that is concentrated in the eye. Vitamin E is a nutrient that plays a role in healthy cellular development. Our Sensitivity formula also contains antioxidant vitamins and minerals, including Vitamin A, C, E, and Zinc for immune support. We make the most important products for the most important people. 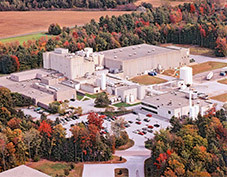 That's why our factory conducts more than 20,000 tests each month to make certain Member's Mark Formulas meet our standards before they meet your standards. CORN SYRUP, MILK PROTEIN ISOLATE, PALM OLEIN, SUCROSE, SOY OIL, COCONUT OIL, HIGH OLEIC (SAFFLOWER OR SUNFLOWER) OIL, LESS THAN 1%: MORTIERELLA ALPINA OIL*, CRYPTHECODINIUM COHNII OIL**, 2'-FUCOSYLLACTOSE‡, FRUCTO-OLIGOSACCHARIDE, LUTEIN, CALCIUM PHOSPHATE, POTASSIUM CITRATE, POTASSIUM CHLORIDE, SODIUM CITRATE, MAGNESIUM PHOSPHATE, ASCORBIC ACID, CALCIUM CARBONATE, FERROUS SULFATE, MAGNESIUM CHLORIDE, ASCORBYL PALMITATE, CHOLINE BITARTRATE, TAURINE, INOSITOL, VITAMIN E (dl-ALPHA TOCOPHERYL ACETATE), ZINC SULFATE, MIXED TOCOPHEROL CONCENTRATE, L-CARNITINE, NIACIN (NIACINAMIDE), CALCIUM PANTOTHENATE, VITAMIN A PALMITATE, CUPRIC SULFATE, THIAMINE HYDROCHLORIDE, RIBOFLAVIN, PYRIDOXINE HYDROCHLORIDE, BETA-CAROTENE, FOLIC ACID, MANGANESE SULFATE, POTASSIUM IODIDE, VITAMIN K (PHYTONADIONE), BIOTIN, SODIUM SELENITE, VITAMIN D (CHOLECALCIFEROL), CYANOCOBALAMIN, POTASSIUM HYDROXIDE, POTASSIUM BICARBONATE, SODIUM CHLORIDE, SODIUM PHOSPHATE, MONOGLYCERIDES, SOY LECITHIN, NUCLEOTIDES (ADENOSINE-5'-MONOPHOSPHATE, CYTIDINE-5'-MONOPHOSPHATE, DISODIUM GUANOSINE-5'-MONOPHOSPHATE, DISODIUM URIDINE-5'-MONOPHOSPHATE). †95% less lactose than standard milk-based infant formulas. Product nutrient values and ingredients are subject to change. Please see product label for current information. *Similac PRO-SENSITIVE® is a registered trademark of Abbott Laboratories. Member's Mark Sensitivity® Infant Formula is NOT made by or affiliated with Abbott Laboratories. Member's Mark Sensitivity® infant formula does not contain the identical proprietary ingredient blend of prebiotics, patented levels of nucleotides, lutein, and lycopene in Similac PRO-SENSITIVE®. ***Comparison based on May 2018 price survey of Member's Mark Sensitivity® vs. Similac PRO-SENSITIVE®. Actual prices may vary by store location and product.